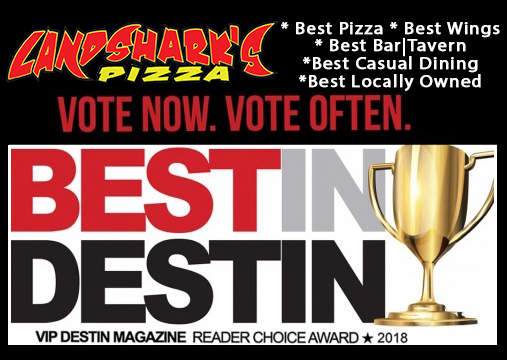 / Best Burger Deal in Destin FL / Awesome CRAFT BEER & BURGER Monday Specials Today at Landshark’s in Destin|PRO FOOTBALL, NHL, NBA & More! 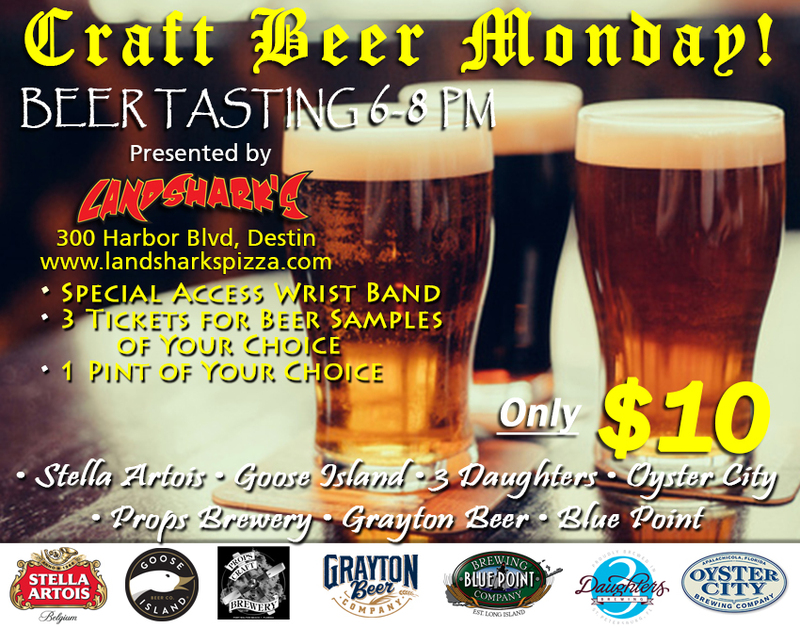 Awesome CRAFT BEER & BURGER Monday Specials Today at Landshark’s in Destin|PRO FOOTBALL, NHL, NBA & More! 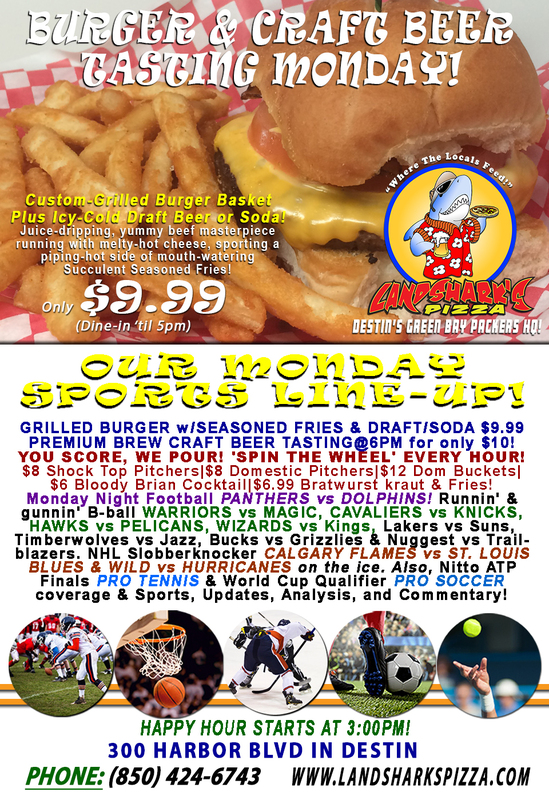 What a GORGEOUS Monday for a sizzling-hot GRILLED BURGER & ice-cold BREWSKIES and a PREMIUM CRAFT BEER TASTING to go with some great game-time specials! YOU SCORE, WE POUR! 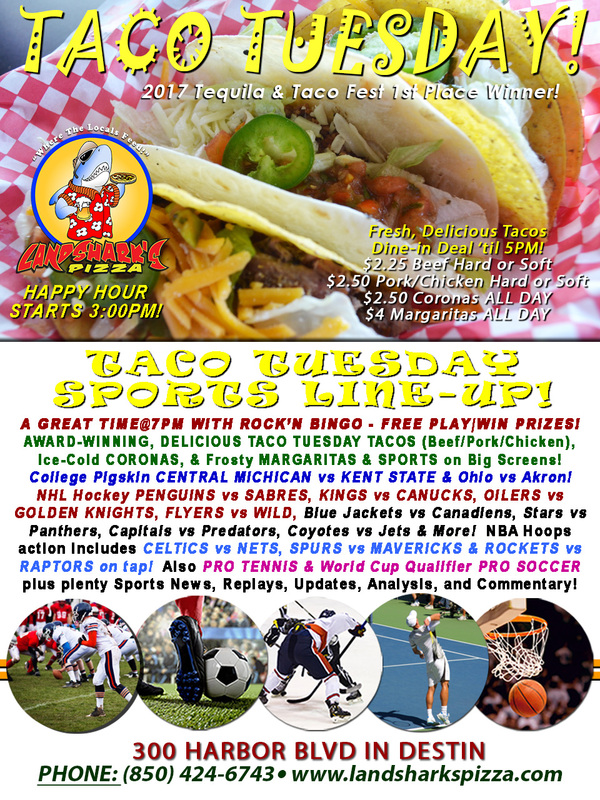 Wear your DOLPHINS or PANTHERS jersey and win a FREE BEER POUR with every touchdown! ‘SPIN THE WHEEL’ DEALS Every Hour! Turn that Monday frown upside down with our custom-built hot, juicy, cheesy, melty feast of a burger accompanied by succulent seasoned fries & your choice of icy-cold Draft Beer or a flavorful Soft Drink for only $9.99 (’til 5PM)! HOT SPORTS ON OUR ARMY OF BIG SCREENS – Monday Night Football PANTHERS vs DOLPHINS! NHL HOCKEY HUGFEST with CALGARY FLAMES vs ST. LOUIS BLUES & WILD vs HURRICANES. Runnin’ & gunnin’ B-ball NBA WARRIORS vs MAGIC, CAVALIERS vs KNICKS, HAWKS vs PELICANS, WIZARDS vs Kings, Lakers vs Suns, Timberwolves vs Jazz, Bucks vs Grizzlies & Nuggest vs Trailblazers. Nitto ATP Finals PRO TENNIS & World Cup Qualifier PRO SOCCER coverage & plenty other Sports Broadcasts, Updates, Analysis, and Commentary! NCAA Football This Week: Tuesday through Friday & Saturday action daily. NASCAR This Week in Miami: Camping World Trucks EcoBoost 200 (Fri)|Xfinity EcoBoost 300 (Sat)|EcoBoost 400 (Sun) all@Homestead-Miami Speedway. Pro Golf This Week: The RSM Classic@Sea Island, GA (Thurs). Previous Post: « Landshark’s NASCAR CAN-AM 500@Phoenix. 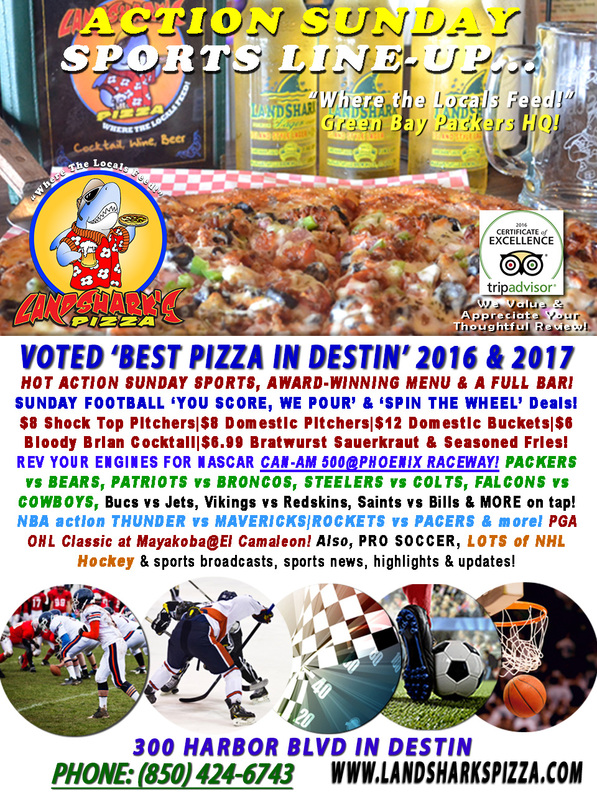 Action Sunday|PACKERS vs BEARS ‘You Score, We Pour’ & More Specials!